First few days of my stay in Milan, I wasn’t really much in going out and in the mood of seeing what’s Milan have in store for my eyes..:-) Few more days passed and I got bored just hanging out alone in my room. 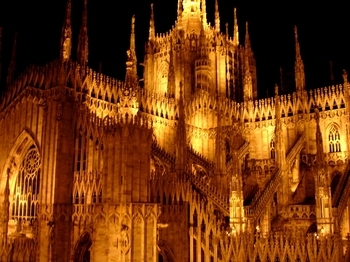 So I bugged two of my friends who are of course, living in Milan for years, to see the second largest cathedral in the world. DUOMO. It was just a tram ride away, we took tram 12 from Molise terminal. Amazing architecture! that just popped in my head as soon as I saw the cathedral. The details and structure is unbelievable. Plaza Duomo is huge at the front that doves can even hang out with the tourists and people in the area…lol… Upon entering the cathedral, security check, they are friendly don’t worry…and cute too..:D Hats off please! Interior is breath taking, solemn, and artistic. Several paintings of the famous Italian painters like Michael Angelo, Da Vinci and Picasso are hanging along the side of the pillars. Underneath and above the cathedral is a must to see too. Although I only got the chance to see the roof top, it is absolutely beautiful overlooking the city. Not to mention its looks during the night, it glows at the dark like a huge golden crown. The lights makes the details artistic sculptures shines and stands out even if you are in distance. Just a glimpse of the cathedral at night wouldn’t satisfy you. I bet you would definitely stare at it the first moment you see it.